Seriously. Enough everyone. I think it’s gotten to a point where so many people have done it that it’s no longer helping your cause. Even today is apparently “International Day Against Intolerance, Discrimination and Violence Based on Musical Preferences, Lifestyle and Dress Code”. Sounds like a good cause actually, but somehow I forget about IDAIDAVBOMPLADC every year. I don’t know why… it rolls off the tongue. Quickly followed by Day of the Dead Day. Why you gotta be hating? I never keep track of made up days like these. WHAT I MISSED CAPS LOCK DAY. IT IS MY FAVORITE TIME OF THE YEAR BECAUSE PEOPLE THINK I AM YELLING AT THEM OVER THE INTERNET. 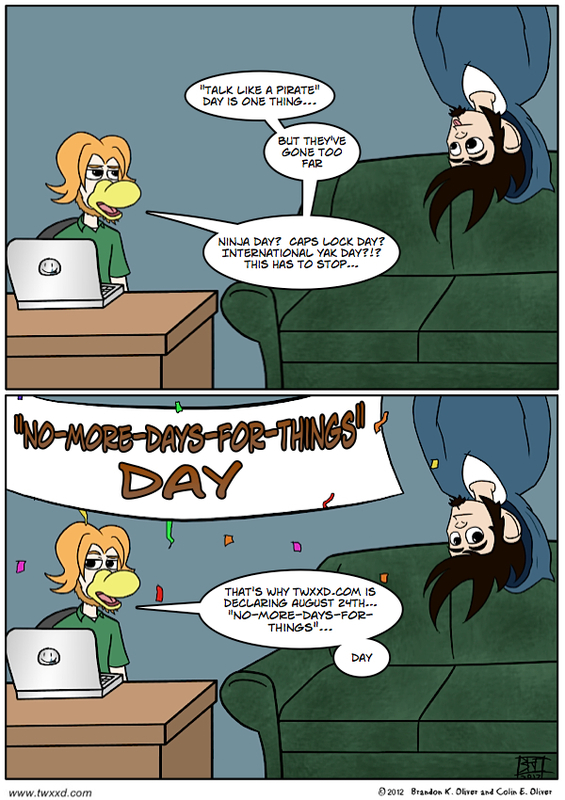 I will celebrate “No More Day For Things Day” by promptly not going out and getting a card for my wife. This is an amazing holiday. I could celebrate this one a few times a year. It could be every day :)!